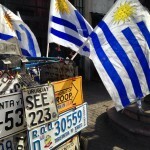 I realized that I haven’t yet written about our time in Montevideo. Yes, I also realize that it was almost a year ago that we were there. Yes, I still realize that we were there for three weeks. Yes, I know that I should have had something to say before now, but I didn’t. You see, I didn’t really like Montevideo. I thought it was drab — quiet in that way that makes you nervous, and gritty to the point of being Detroit-y. If Buenos Aires is the most European city in South America, then Montevideo is the most Eastern European city in South America. I’m thinking Belgrade. So because of that I just didn’t have much to say. But then, as I sit here in Tulum and suffer through yet another expensive cut of meat that is improperly cooked, I remember: there’s one thing about Montevideo that I loved. Adored even. It was perfect. It was the Port Market. We went there for lunch and spent all afternoon. I happen to love urban ports. The aforementioned grittiness is part of their charm, and the history generally associated with said ports is fascinating, as port cities were vital to a country’s economy in the days before air travel opened up the world to a new kind of market. Montevideo’s port is no different, and its current rough-around-the-edges look does little to modernize the Old City area at all. In fact, I could easily imagine the stevedores of yore pulling in, pockets laden with payday cash, in search of alcohol and companionship. The port market was officially opened in 1868, and its components were manufactured in England and shipped over, then assembled on site. The market did a thriving trade in livestock, produce, and slaves. Montevideo’s Port Market is a bit different today. Surrounding the building you’ll find vendors selling antiques, leather goods, and art. But inside? Inside is where you’ll find the food. Vendors sell cool antiques outside. And you might never want to leave. 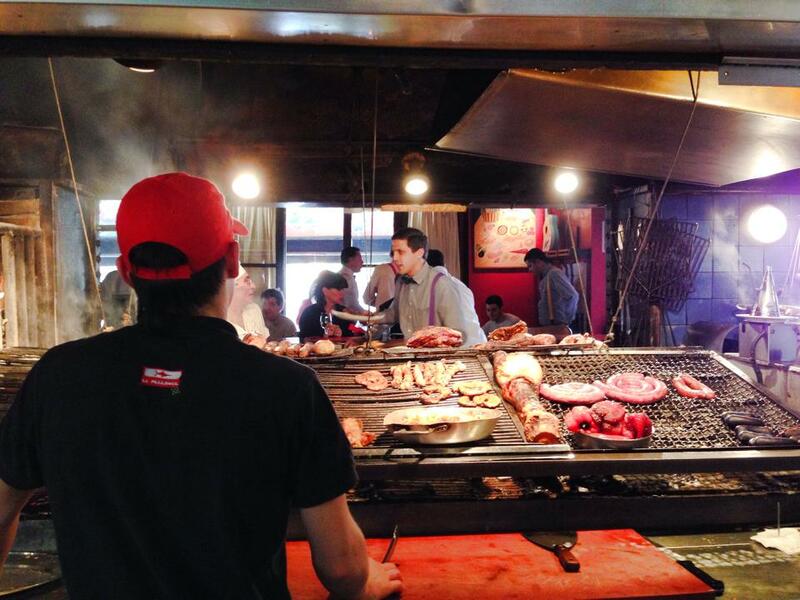 Argentina gets all the love when it comes to meat. Their asado is the stuff of legend. 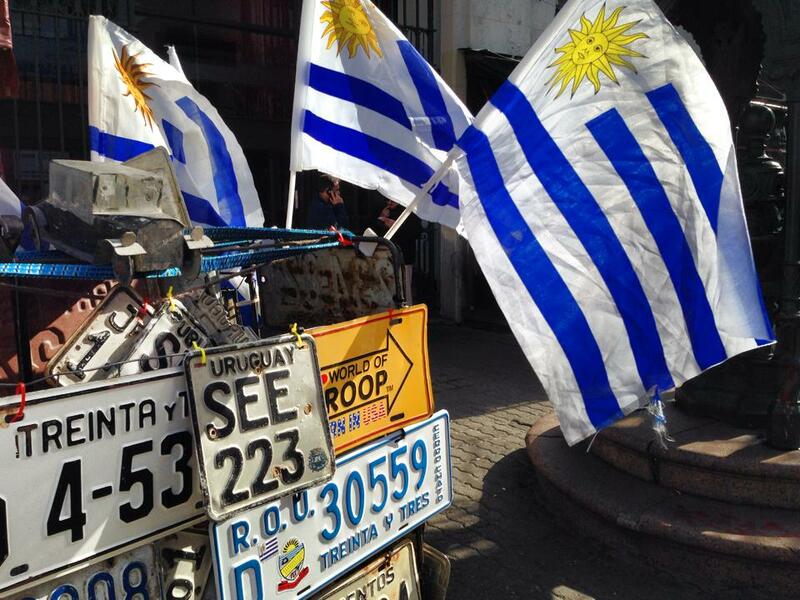 As Buenos Aires is just a few hours away from Montevideo by ferry, it’s not surprising that Montevideo’s Port Market is filled to capacity with asados, the famous barbecues. Push open the doors and you can smell it. The smoke laced with rich beef fat, the savory scent of sausage, and an undercurrent of wine greet you as you walk in. The sunbeams filter through the dusty skylights and penetrate the layers of smoke, giving the space an otherworldly light that is a photog’s dream. Then there’s the noise. A cacophony even, as half of the city descends here for lunch. The smoky light inside is beautiful. Our Airbnb hosts told us which asado stall to visit, and I think we made it to the right one. That was no easy feat. 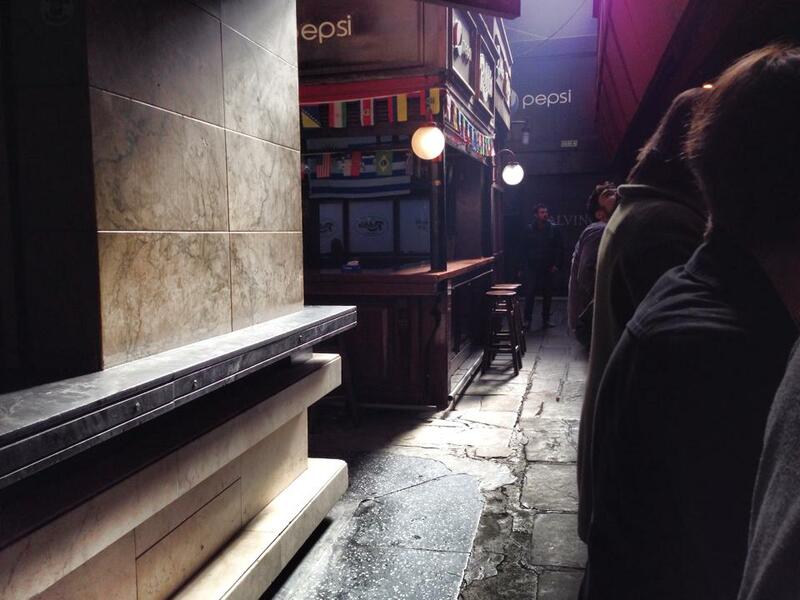 The building is a maze of restaurants, bars, and stalls and it’s easy to get turned around. But, then again, I think you could choose any of these establishments and walk away full and happy. Two seats were open at the bar so we quickly sat down. The roaring fire directly in front of us took away some of the July chill, and we were handed a menu. I quickly settled on a filet, because I always have the filet, and we added some french fries and a bottle of wine to our order. The waiter whirled away, dodging the man who was tending the sizzling meat, and I glanced around. The chefs tend the grills. The couple to my right were tucking into a tightly coiled sausage drenched in sauteed veggies. The man across the bar raised his fork from his tray, and a hefty string of gorgeously fried cheese followed. The grill in front of me was covered in meat, and the chefs kept throwing on the wood, sparks rising each time. The wine bottled specifically for Palenque. 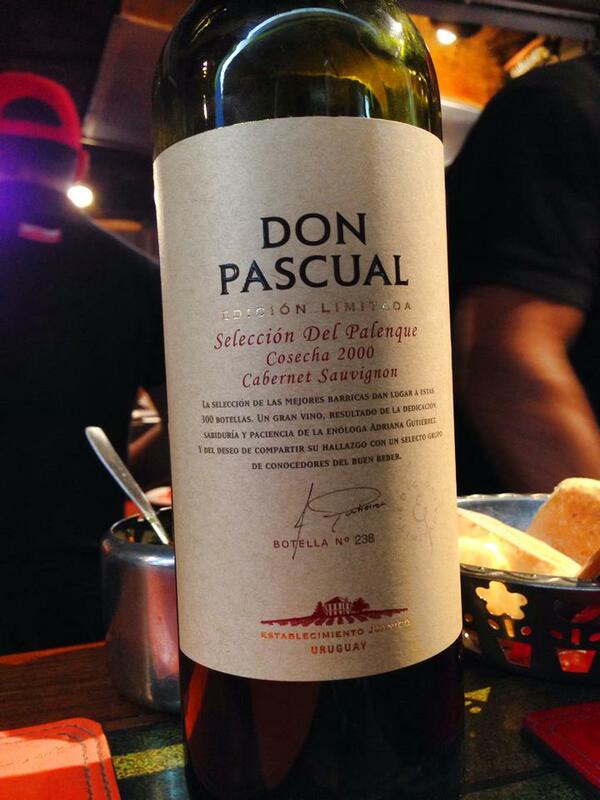 Our waiter dropped off our wine, a rich and spicy cabernet that had been bottled and labeled specifically for this restaurant by a Uruguayan winery. 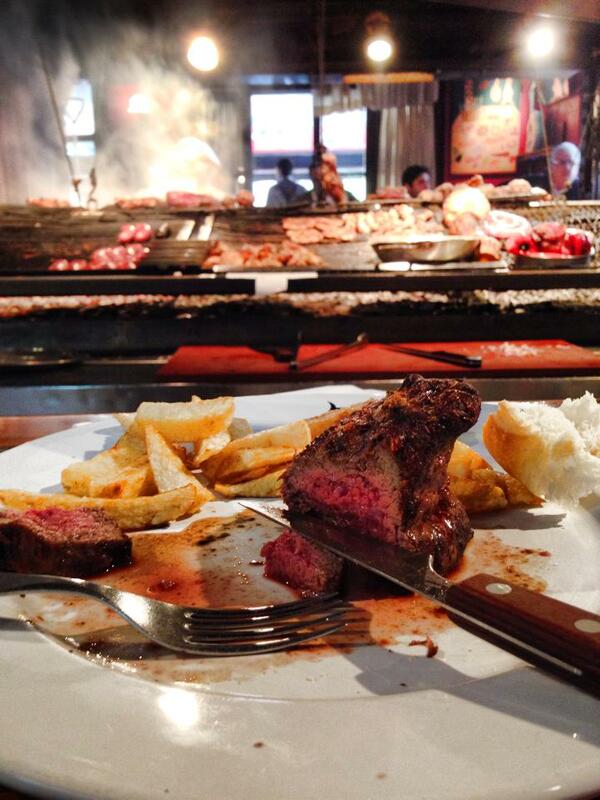 Our steaks followed, gorgeously charred and bright red on the inside. I sipped and chewed and looked around, certain that I didn’t want to leave. The expertly cooked steak at Palenque in the Port Market. And we didn’t. We sat there all afternoon, sipping wine and laughing, talking about all of the things that we talk about when we’re traveling, tipsy, and in love. We capped off our day with a Jameson and a beer at the small bar near the door. A working man’s bar in this working man’s city, this bar was populated by the same type of men that have been bellying up for decades. 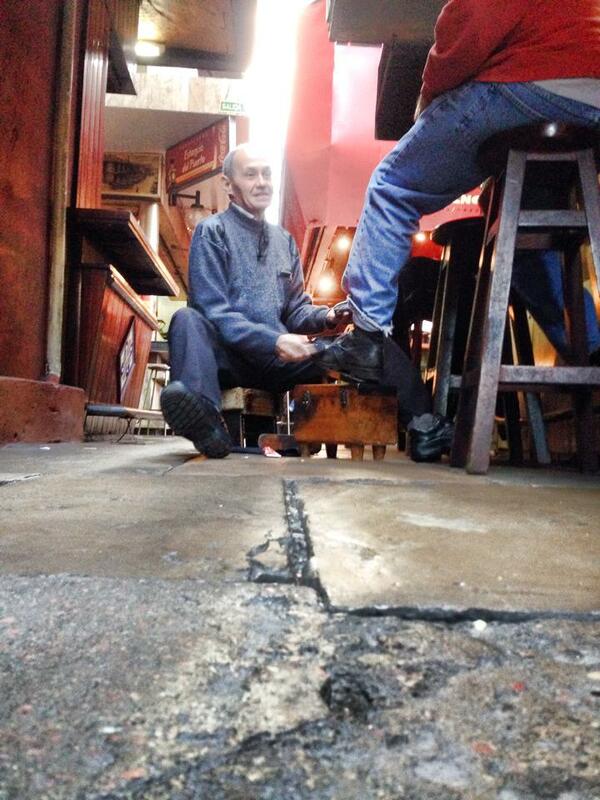 Shoeshine at the Port Market. The taxi drivers, the sailors, and the dock workers. The bar’s chipped and frayed linoleum top, stained by countless drinks, was testament to that. We finished our drinks and walked back to our apartment, my previously meh perception of Montevideo colored a bit brighter by an afternoon that will be marked down as one of the best I’ve ever had. Note: Montevideo’s Port Market is open from noon to six every day except Sunday. Saturday is the most popular day to visit the market for lunch, so be there early. Disclosure: This post is sponsored by Hipmunk. All content and opinions are my own.